Lock in a great price for Penzion Pristav – rated 8.1 by recent guests! The host was really friendly and keen to help, even without speaking english. The location was really close to city center, easy to go walking to anywhere. The breakfast included was simple, but meets my expectations: bread, option for tea or coffee, butter, jam and ham/cheesse. The shower was really good, the adjustment for water temperature and support level worked really well. Very friendly host and the rooms were large and clean. It's near the water and some restaurants. The manager/owner (?) was exceptionally helpful and kind. The accommodation is quite basic but the customer service was second to none. Jestli očekáváte ubytování exclusiv a stříbrné tácy, jeďte někam jinam. Jestli očekáváte pohodu a individuální přístup, je to správná volba. Já se těším na letní pobyt. na postelích jsou pružinové matrace a dost vržou při každém pohnutí se. Pan majitel byl, velmi příjemný a starostlivý. Penzionek je menší a o to klidnější, jsme moc spokojeni a doufáme, že se v létě najde místečko a jedem znovu. Majitel penzionu je velice ochotný a hezky se o své hosty stará. Opravdové teplíčko, klid. Velká lednice na pokoji, rychlovarná konvice, dětská postýlka. Penzion Pristav This rating is a reflection of how the property compares to the industry standard when it comes to price, facilities and services available. It's based on a self-evaluation by the property. Use this rating to help choose your stay! 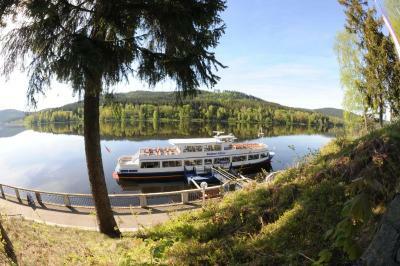 Only 500 feet from the shore of Lake Lipno, this guest house features a restaurant with Czech cuisine and offers free public Wi-Fi. 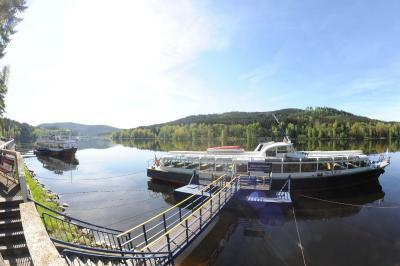 Boat and bicycle rental services are available. All rooms at Penzion Pristav come with satellite TV and a private bathroom. They overlook the lake and its surroundings. 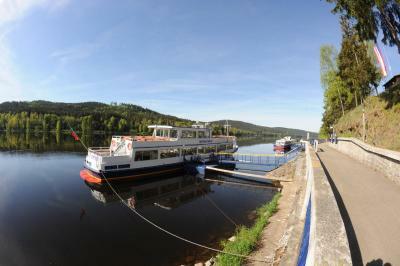 Set in Lipno nad Vltavou, the Pristav is 1,000 feet away from the marina and an indoor swimming pool. Free private parking is offered on site. When would you like to stay at Penzion Pristav? House Rules Penzion Pristav takes special requests – add in the next step! The street to get access to the hotel had no lighting at all. It was not insecure, but could be better. The towels had cigarette smell. It was not flagged at no time/anywhere that the payment should be done only by cash. The time for breakfast could be earlier. Actually, started just 8:30. Breakfast from 8am could be earlier? Outside it's quite messy, but it wasn't a problem once we saw the room and met the owner.